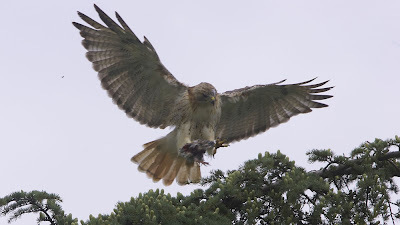 Q. I've been wondering if we may be seeing evolution at work with regard to urban hawks and their eating preferences. PM prefers pigeons so he is less likely to be poisoned and likely to have more eyasses due to his long life. Some of his offspring may get a preference for pigeon and thus be more likely to survive and pass on the preference. Over time, the pigeon eaters would be more successful and the rat eaters would be less represented in the population. Even if there isn't a gene for pigeon eating (dietary preference), PMs offspring could prefer pigeon just because they were raised on pigeon rather than rat. Certainly the rat-eating red tails have paid a high price this year and have been removed from the breeding population. Your thoughts and/or Blakeman's thoughts would be appreciated. ou think like a biologist (or are one). But no, there will be very little genetic selection for pigeon hunting, against rat predation, for the following reasons. First, Red-tails hunt by sight, preying upon animals that appear to be vulnerable. They clearly do not select prey for taste, only for convenience. Red-tails are big, and not so fast as typical bird-eating raptors such as Cooper's Hawks and Peregrine Falcons. Red-tails can take pigeons only with stealth, by clever stooping (diving) attacks on pigeons not paying attention on the ground or on nests. Otherwise, a pigeon can easily out fly a lumbering Red-tail. NYC Red-tails are taking dumb and inattentive and young pigeons. And they will continue to take rats, as those are their instinctive, preferred prey. Red-tails across their continent-wide range subsist on small rodents. The eyasses in the nest will not gain a prey preference from an abundance of pigeons being brought there. The fledged eyasses will have to learn to hunt in the first summer, and they will be utterly unable to catch any pigeon then; the hawks aren't clever enough or fast enough to do that when just learning to hunt. They will concentrate on the easiest and most abundant prey, and in NYC it's Norway rats, far and away. Later, as experienced adults, they will learn to take pigeons. But none of this gets genetically selected. There might seem to be a selective advantage for Red-tails eating primarily pigeons, and avoiding poisoned rats. But it would take many hundreds of generations for this to be expressed as a new, instinctive prey preference, if it ever could be. The important matter is this. Red-tail populations can withstand rather large annual losses and yet remain viable. Reproduction exceeds deaths of reproducing adults. We just must accept the large losses of immatures. 21 April 2012: Extraordinary North End Day! On one memorable day Starr Saphir had three of Central Park's rarest avian visitors:Common Raven,Prothonotary Warbler, and Blue Grosbeak, along with two other notably uncommon birds:Orange-crowned Warbler andWorm-eating Warbler. As her Saturday walk was beginning, Starr saw a Common Raven being harassed by some Blue Jays south of the Great Hill. The Raven turned on the Jays, and then headed south into the Park. Prior to December 2011, eBird shows no recorded observations of the Common Raven in Central Park for most years. Since then, it has been noted only a handful of times. This auspicious start carried through the rest of the morning. 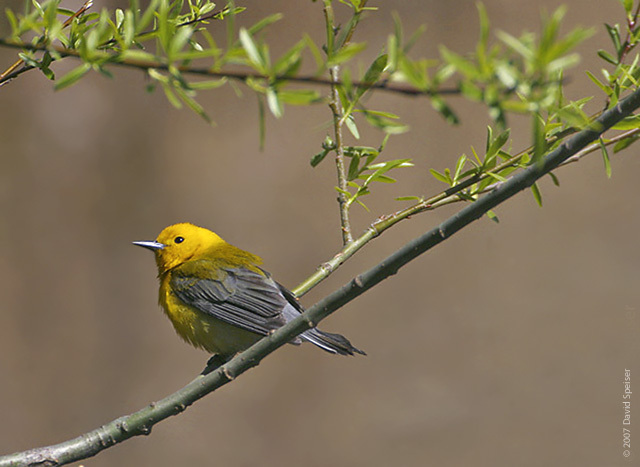 After learning of reliable reports of Orange-crowned Warbler, Worm-eating Warbler, and Prothonotary Warbler in the Wildflower Meadow area initially found by Tom Perlman, Chris Cooper, and Jacob Drucker, Starr brought her group directly from the Pool. Over a half-hour of searching ensued, as many other birders responded to the earlier alerts. They saw plenty of Yellow-rumped Warblers in the surrounding trees, along with someChipping Sparrows. They also heard Eastern Towhee and Carolina Wren. But the warblers they sought were nowhere to be found. After hearing some trilling coming from the very large fenced-in tree atop the meadow, Starr soon re-sighted the Orange-crowned Warbler and most in her group got good views. The bird reappeared again about ten minutes later. 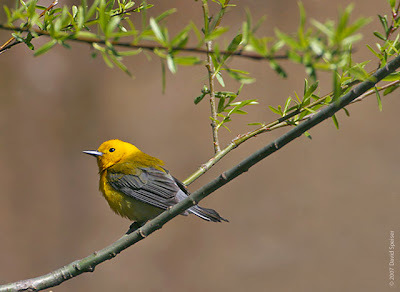 The group did not have long to rest, however, as a call soon came in from the Loch that the female Prothonotary Warbler had also been re-found. All moved quickly down the path and within minutes were treated to excellent close views of the strikingly elegant bird. Starr quickly described the location of the bird as it moved about without pointing at it (as pointing frequently spurs songbirds to fly away), and her running commentary helped group members and other birders alike stay focused on the Prothonotary, which surely was for many (if not most of those assembled) a life Central Park bird. Without question it was our best bird of the day. The excitement, however, was far from over, as an 8:25AM text message alert said that Doug Kurz was seeing a Blue Grosbeak just 200 yards away by the 102nd Street transverse road. Your webmaster (and others) ran up the hill to get it, and after some fleeting views it appeared to fly to the so-called Grassy Knoll, where we were rewarded with good views of it on the ground. As Starr and her group were making their way up the Wildflower Meadow toward it, Starr finally got the elusive Worm-eating Warbler by the large fenced-in tree. Meanwhile, the Blue Grosbeak flew, but later, toward the end of the day's walk, Starr re-found it to cap off a truly incredible day. 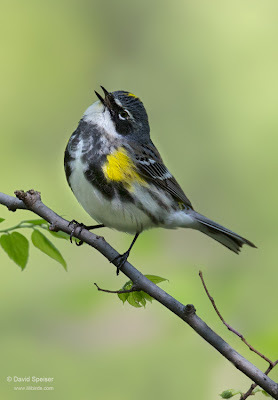 Starr also had the first reported Black-throated Blue Warbler of the season in Central Park. 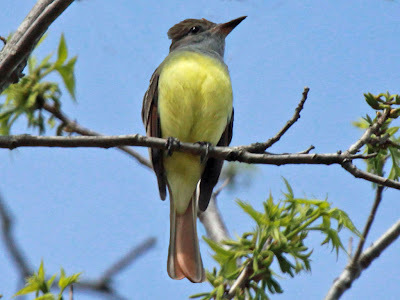 Other noteworthy sightings, which were also firsts of the year for her group included a Great Blue Heronflyover; an Eastern Wood-Pewee on the Great Hill; a Warbling Vireo near the Green Bench; a Yellow Warbler; and a Black-and-white Warbler. Altogether the group added 11 new birds to the season list. The total came to 53 species for the day, of which there were 9 warblers.